There are two through trips in the Cirque de Saint Même, both of which are written up in Fabien Darne's and Patrice Tordjman's À Travers le Karst. The Gouffre Tasurinchi is a top entrance that drops into the Grotte du Guiers Vif, the source of the water in the cirque, and just 700 m to the north is Grottes des Masques which is a top entrance into the totally distinct Grotte du Mort Ru system. The former offers a 305 m deep pull-through, and the latter a 252 m deep pull-through. 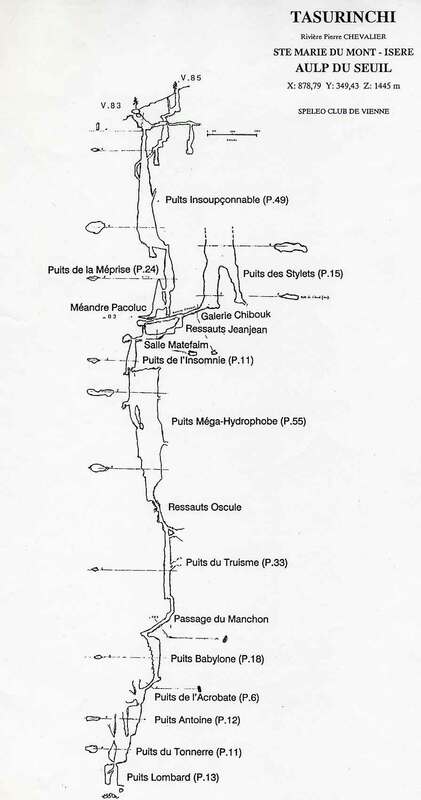 A cross-section of Gouffre Tasurinchi prepared by the Spéléo Club de Vienne may be found here. Parking in Cirque St. Même, follow the Pas de la Mort to above the iron work. From here, the path traverses across the flank of the hill, until it turns left to climb up through a breach in some cliffs. Above this the main path turns round the head of a shallow valley at a large cairn, with a smaller path leading up the valley. Follow the latter for a few metres into the bottom of a meadow. Forty metres to the right there is evidence of a campsite just inside the trees. From this, take the small footpath that runs west back into the wood for about 80 metres until you come to a circular depression about 10 metres across. Go round to the other side of this, and about 20 metres to the south is a large fissure heading north / south. Looking downhill about 10 metres from the start of the fissure you will see a depression about 40 metres away. That is the Gouffre Tasurinchi. From the car park in Les Varvats, a small hamlet above St. Même, follow a forest track for about 40 minutes to a clearly marked junction, where the right-hand option, the Chemin de Tracarta, is taken. Follow this up to about 1400 metres altitude where a thin path will be found heading to the right at the point the main path turns abruptly. Grotte des Masques is the obvious cave entrance at the base of a small cliff on the left about 3 minutes along this thin path. It is worth noting that a printing smudge in À Travers le Karst hides the minimum rope length recommendation for the pull-through - it is 70 m.